A visit to Rhino Ridge Safari Lodge in KwaZulu-Natal consists of a scenic location, comfortable accommodation and exciting outdoor and wildlife safari activities. Rhino Ridge Safari Lodge in KwaZulu-Natal offers accommodation in a variety of suites in villas that can host up to 44 guests in twin or king bedrooms. The Honeymoon Villas are ideal for couples seeking romance on an unforgettable getaway and families will enjoy the spacious Bush Suites. 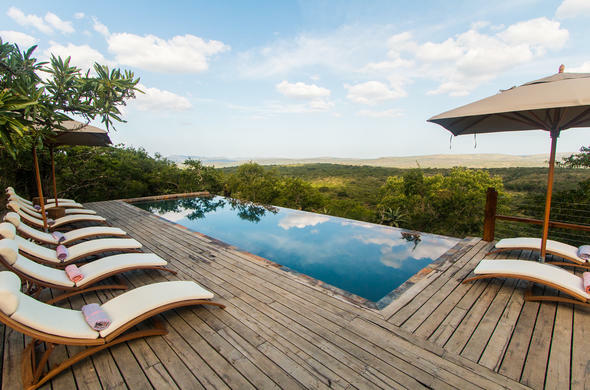 Located in the Hluhluwe-iMfolozi Park in northern KwaZulu-Natal, this lodge in South Africa is home to a large variety of wildlife species and scenic landscapes. Spot the Big Five on a guided safari drive or track the sea turtles as they occupy the shores to breed. Day trips to the nearby St Lucia offers you the opportunity to go kayaking and a visit to the Isimangaliso Wetland Park introduces you to South Africa's first World Heritage Site and its natural wonder. Upon return to Rhino Ridge Safari Lodge and an adventurous day outdoors, you can relax during an optional spa treatment.